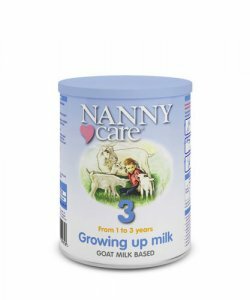 NANNYcare Goat Growing Up Milk is specially formulated to enhance and fortify goat milk to better suit the nutritional needs of toddlers and young children (1-3 years). Significant nutritional benefits over cow’s milk and also standard goat milk . Fortified with iron to protect against deficiency. Good source of calcium and Vitamin D for strong bones and teeth. Lower in sodium and saturated fat. Excellent nutritional insurance policy for toddlers. Unique protein profile and readily absorbed medium-chain fatty acids for easy digestion. Delicious tasting and free of added sucrose and glucose syrups. May be used to replace all milk intake including in cooked dishes. Follow the feeding instructions carefully using only the 4.5g measuring scoop provided. Add one scoop to each 30ml (or weight 80g to add to 540ml) of cooled boiled water.Always wash your hands before preparing feed.1 Wash cup (or measuring jug) and utensils in hot soapy water. Rinse well.2 Boil water and allow to cool to feeding temperature (37°C). Measure water volume into a clean cup (or measuring jug).3 Add the required number of level scoops of powder. Fill the scoop lightly and level. Store in a cool dry place (do not refrigerate).Use within 4 weeks of opening. Use within 4 weeks of opening and store in a cool dry place. For hygiene reasons, do not store made up feeds. Make up each feed as required and always discard unfinished feeds after 2 hours. If necessary offer cooled boiled water between feeds. Do not heat in a microwave . Hot spots may occur and cause scalding. Infants should be supervised at all times when feeding. Never leave your baby alone during feeding. Pasteurised goat milk solids (62%), lactose (from milk), vegetable oils (sunflower and rapeseed), minerals, vitamins, acidity regulator (citric acid), choline chloride, taurine, L-carnitine. VITAMINS: Ascorbic acid, dl-α-tocopheryl acetate, nicotinamide, retinylacetate, cholecalciferol, calcium d-pantothenate, cyanocobalamin, phytonadione, thiamin hydrochloride, pyridoxine hydrochloride, riboflavin, folic acid, biotin. MINERALS: Calcium citrate, Calcium hydroxide, sodium citrate, potassium chloride, ferrous sulphate, zinc sulphate, copper sulphate, manganese sulphate, potassium iodide, sodium selenite.